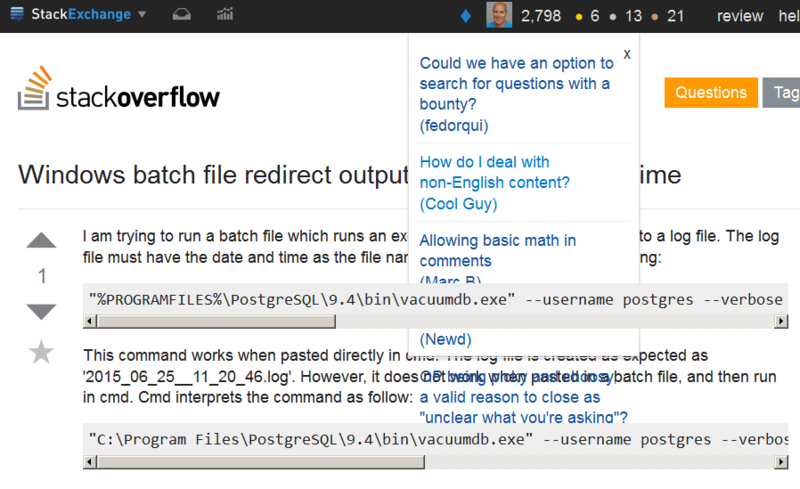 Stack Overflow Extras (SOX) is a project that stemmed from the Stack Overflow Optional Features (SOOF) project. The SOX userscript adds a bunch of optional features to all sites in the Stack Exchange network. These can be toggled on or off from an easy to use control panel (see screenshot below). Note: This project has no relation to Stack Overflow or Stack Exchange; it is simply a userscript that enhances the sites! Install Greasemonkey (for Firefox) or Tampermonkey (for Chrome or Safari). These are userscript managers that must be installed in order for this to work, as the script relies on certain GM_* functions in order to save your settings! Install the script. Clicking on 'install' below will make your userscript manager prompt you automatically to install it. A full list of all the features is available on the SOX wiki page here. Please post bugs and feature requests as issues on Github, where we can track them easily and push updates quickly. Please do not post them as answers on Stack Apps -- they are much harder to manage! Pull requests to add new features or improve the existing ones, etc. are welcome! Please head to the Contributing wiki page to get started. Please see the change log at Stack Apps. On 2016-02-12, SOOF was renamed to SOX and rewritten by ᔕᖺᘎᕊ and ᴉʞuǝ. The versioning was reset. You no longer have to have an access token to use SOX; if you choose not to, then any features needing the API will simply be disabled. Thanks @Izzy for the suggestion. Deprecated feature to paste images directly into the post editor (now native); feature to add notifications to your inbox when a post you downvoted was edited. The fixed topbar feature has been deprecated as it is natively supported now! 2016-02-12 - v1.0: SOOF is now SOX. Please see the revision history for this post to see the change log for SOOF, before it was renamed. With this change, the script seems to work on Firefox (although I haven't properly tested all the features yet). status-completed Every time I open the options dialog, all the checkboxes get checked. It would be much better to have them retain their previous state. In particular, this interferes with trying to make the checkboxes retain their state (which is otherwise fairly simple). Simply removing this (apparently unnecessary) line makes it work better; the new settings will override the old when submitted, anyway. status-completed I don't see any particular reason why I shouldn't be allowed to disable all the features, if I want. That extra check seems just plain useless to me. status-completed Also, the "Options were saved!" alert after editing the options gets kind of annoying after a while. status-completed Also, the "add features" link injection doesn't seem to work on the fancy new user profile currently in testing on meta.SE. You might want to add compatibility for that, especially since it'll likely be rolled out network-wide sooner or later. It would be great if the upvote button was visible all the time. This doesn't work for Stack Overflow, due to the new topbar design. For now, you must use the Dev version to make it work on SO. This appears to break the styling of title bars on at least beta SE sites. It would be good if it didn't obscure the top part of the title bar. When stackoverflow-code-expando is disabled there is no issue. Appears to be a z-ordering issue? Firefox 38.0.5, Windows 7 4Bit. 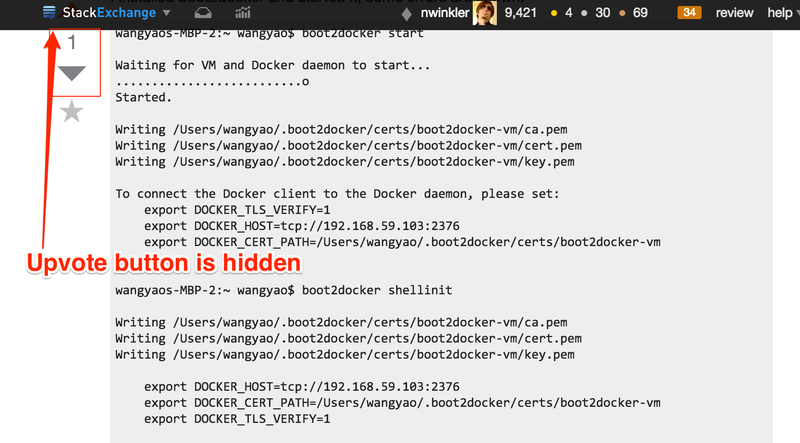 Here is a screenshot of the problem from StackOverflow. The Change the 'share' link to show link as markdown format feature has the annoying side-effect that the replaced text in the form [text](link) is not selected when clicking the share link. It is pretty annoying to manually having to select the text - it would be better if the whole text was already selected, so I could copy it directly from the box. The bar position is broken. The vote button is broken. The post content moves to the left. Installation completion dialog box opens every time I visit a SE page. Click on the first URL to get your SE access token. After that, the popup will reopen, you just need to save your preferred settings again. My SOX appears to "time-out" after 24 hours. 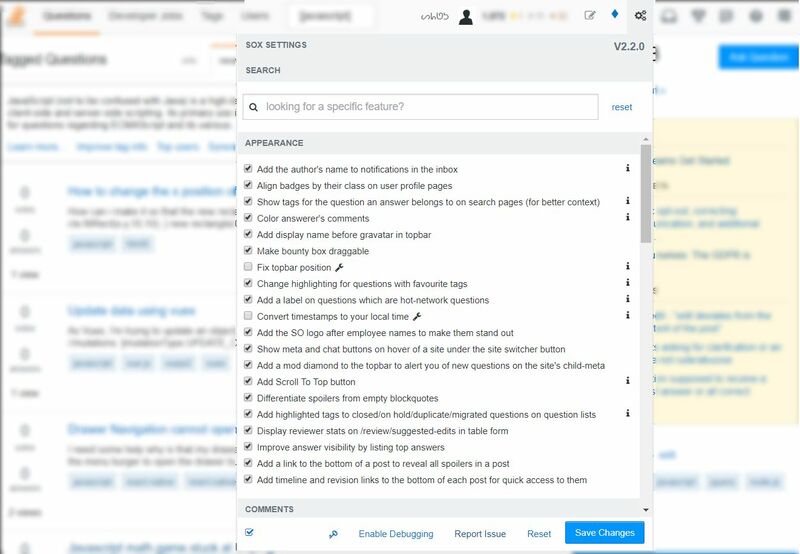 Some features are still available, but elements like 'Show tags for the question an answer belongs to on search pages (for better context)' stop working. Mixed Content: The page at 'Stack Overflow Extras (SOX)' was loaded over HTTPS, but requested an insecure XMLHttpRequest endpoint 'http://stackapps.com/posts/6091/revisions'. This request has been blocked; the content must be served over HTTPS. This issue can be resolved by resetting SOX and requesting a new token. The recent top bar rollout seems to have broken the tools again as I am no longer able to access the menus such as settings or the meta link which shows new activity and my name is now showing as false. 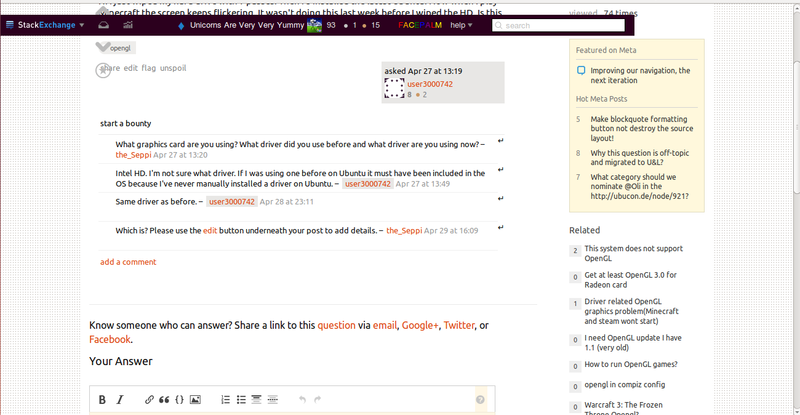 View questions & answers inline from any comment or post! A userscript collects all useful userscript?